About a week ago, I looked down at my hand and noticed that one of the diamonds on my wedding band was missing. I don’t know what happened to it. It could have fallen out anywhere. 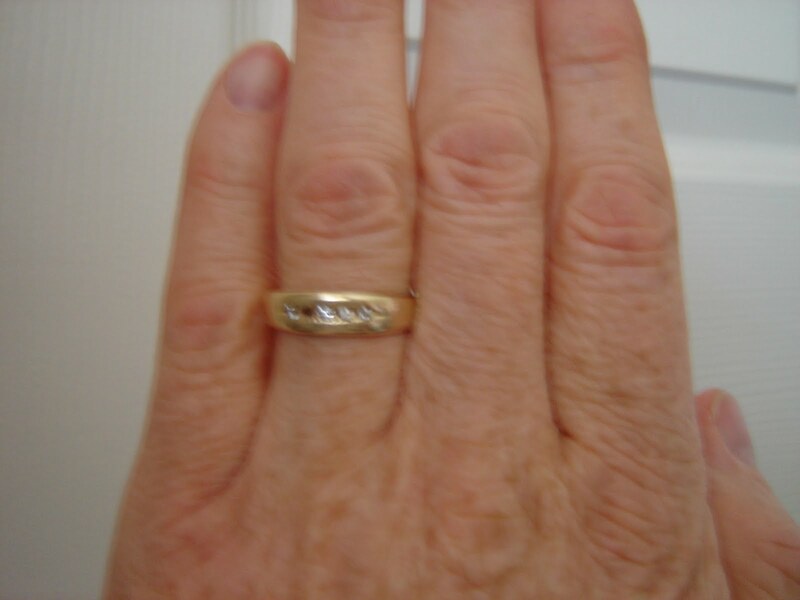 After wearing that ring for 32 years, losing that diamond makes me pretty sad. The chances of finding the diamond again are slim to none. Originally, my ring had five diamonds in it. After our children were born, I imagined that the middle diamond, the largest, represented the Lord, and that the other four stood for my wife and three daughters. Now one of those is missing and it’s bothering me. I can replace it, sure, to fill in the empty spot on my ring, but how can it be the same? As I’ve thought about this for a few days, I’ve realized that we all have missing diamonds in our lives. Not precious stones, but the real diamonds: The people who mean the most to us. Many of us have children who have slipped away. They’ve grown up. They’ve moved away or moved on to other pastures. Some have slipped away due to marriage or school, others through rebellion. It doesn’t matter either way. We miss them and long for them, for what we once had or for what could be. Our close friends or parents are separated from us by many miles and we feel like we have so little time to spend with them. And what about the friends and family that are very close to us physically, but who are separated from us emotionally. Even people living in our own homes. Some of us sleep next to our missing diamond every night, separated by miles of misunderstanding. How do we reclaim what is lost to us, when our heart’s desire seems completely out of reach? As simple as it sounds, patience and faith are the keys. All losses will be made up to the faithful. That which has been lost to us, if it ever were ours, will be placed in loving arms again. Or perhaps its equivalent. Or perhaps something that has meant a lot to us here will be placed in it’s proper perspective and accepted, just as it stands, with joy. I don’t know how it will all work. But I trust and believe. I have a friend who has a very deep regret. At the time he graduated from college, having met the girl of his dreams, he was preoccupied with his new career and wasn’t ready to get married. He let her slip through his fingers. Now many years and several failed marriages later, he still thinks about the one that he let go, one who is now happily married to another and has a wonderful family. How will his loss be made up? I don’t know, but I believe that God will comfort him, whether the loss was caused by his own choice, as he feels, or whether it was caused by the choice of others. I don’t know how God will accomplish this miracle, but I know He will. We will have great peace, peace that will stretch across eternity. We won’t have to look for what is missing any longer. Of course, we must do all we can to recover what is lost, or, if necessary, leave it in God’s hands, whatever the case or need may be. That’s the tough part. Hanging on and not giving up. Not giving up or giving in. Not cashing out, imagining that God has failed us in some way. I have many losses in my life, but I have to say most of those losses are temporal. I have the most precious possession in my hands already, a kind, beautiful, loving wife, and three wonderful daughters, all faithful in the gospel, all doing their best, independently, to live life as God would have them. I can’t tell you how grateful I am for this, more grateful than anything. Having this, my other losses by comparison are trivial by any measure. But I still have my losses. Dear ones I have loved but who have walked away from their covenants and promises. People who will not accept my efforts to love them, try as I may. Friends lost on the plains of regret, the tundra of choices that they cannot fix by themselves. Nevertheless, I trust. I believe. I hope. I hold a bright vision in my mind of being reconciled and whole again with everyone. After I have done what I can, God will make up the difference. I know He can, and I know He will. That is my peace. I don’t know what is missing in your life, but there is no need to fear. The “restoration of all things” (Act 3:21) not only includes lost truth, doctrine and ordinances, but also your personal losses, however small. They will be acknowledged and your lost diamonds will be returned.